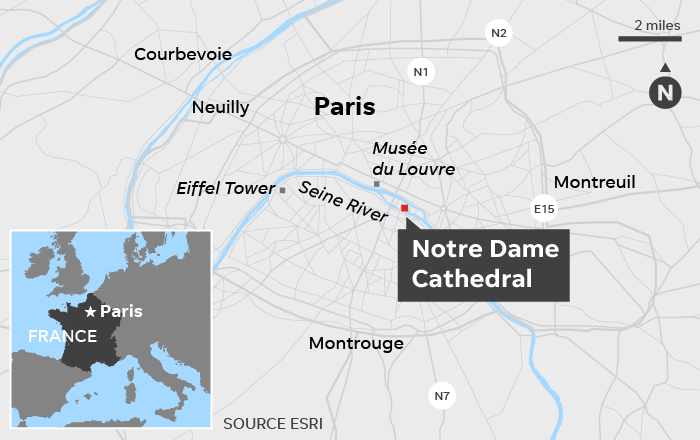 PARIS – A massive fire was raging at the famed Notre Dame cathedral in Paris and threatened to burn the 800-year-old landmark to the ground as shocked crowds gathered on streets, bridges and squares to watch in horror. The famed cathedral’s spire was engulfed in flames Monday before tumbling over. A spokesman said the entire wooden frame of the cathedral would likely come down. Salvage efforts were underway to recover precious artifacts and city prosecutors announced they were opening an investigation into the fire, which preliminary accounts say appears to be accidental. There was no immediate word on injuries. Many tourists and others in the area tapped social media to notify friends and relatives that they were not harmed. The blaze comes during Holy Week, an important event for the Catholic church with Easter six days away. Firefighters blasted the inferno with water from a ladder trucks but did not tackle from above. Some could be seen laboring inside the structure itself. Elias Cohen, 21, a business student in Paris, was among the throngs of people who stared at the burning spectacle and tried to put it in perspective.